CIP-014-1, Requirement R1: identify substations that, if damaged, could result in widespread instability, uncontrolled separation, or Cascading. Our comprehensive modeling methodology is based load flow and dynamic simulation. CIP-014-1, Requirement R2: review your list of critical substations. CIP-014-1, Requirement R5: develop a comprehensive Physical Security Plan to mitigate the risk. In a nutshell, a comprehensive risk assessment must be performed on applicable transmission substations. The first step is to identify transmission substations that, if damaged, could result in widespread instability, uncontrolled separation, or Cascading. Deficiencies identified in the analysis must be addressed with a Physical Security Plan. The standard requires an independent third party review or the risk assessment and corrective action plan. Is the standard difficult to follow? 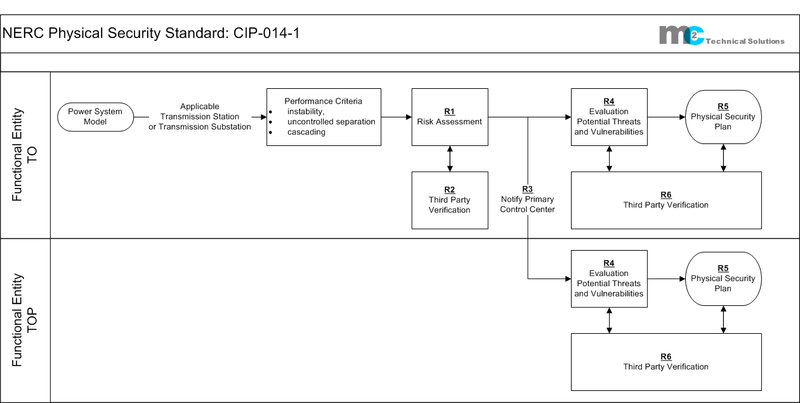 The flow diagram illustrates the sequence of requirements R1 through R6 in CIP-014-1 and the applicable functional entities.